Rewind 10 years ago and London was a barren land for vegan food. It was nigh on impossible to satiate the taste-buds of plant-powered diners, with options lacking any sort of imagination or flavour. Fast forward to 2019 and things have take a rapid turn; the capital has spawned a mind-boggling number of plant-based restaurants and street food outlets. Veganism has become overwhelmingly accessible: it’s gone from lacklustre bowls of pasta to innovative meat-free products. 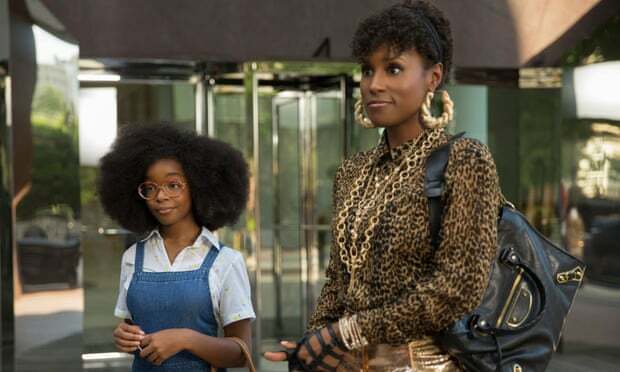 And the lifestyle change is showing no sign of slowing down; according to The Vegan Society, demand for meat-free food increased by 987% in 2017 and it was recorded that 300,000 people took part in Veganuary (a nonprofit organisation that encourages people to go vegan for the month of January as a way to promote and educate about a vegan lifestyle) this year. While free-from products are hitting the supermarket shelves at an alarming rate, a new wave of plant-based restaurants are continuing to open in London, and one of the new arrivals is Halo Burger in Pop Brixton. Nestled in the middle of this south London outfit, Halo Burger rubs shoulders with some of the biggest street food names including Made of Dough, Other Side Fried and Petare. Halo Burger operates out of a container-turned-restaurant, where its diner-style interiors and order at the counter service lends itself to a quick bite, rather than a romantic meal whispering sweet nothings across the table. Halo Burger is unlike other vegan burger bars for a number of reasons: you can’t tell it’s vegan. Its US inspired neon yellow and red signage shows no plant-based jargon, or irritating meat-free puns. Secondly, it’s one of the few places in London which sells the Beyond Meat patty. 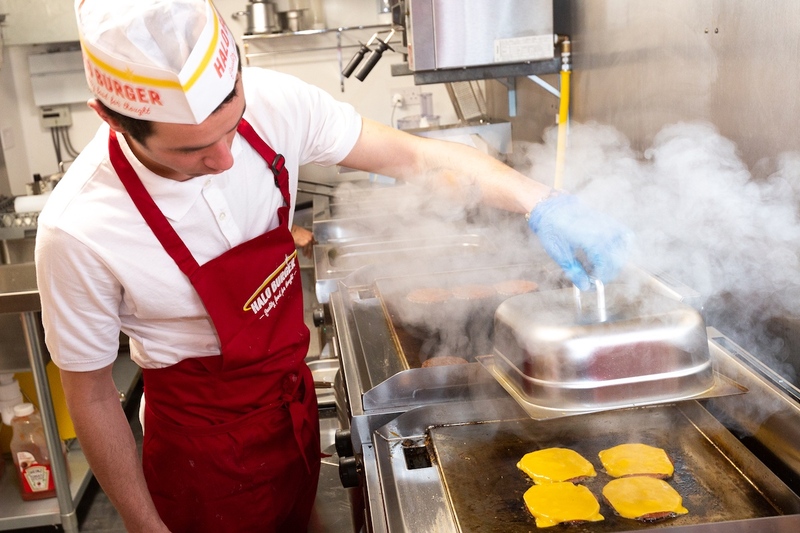 The company have completely revolutionised animal-free eating, pioneering the world’s first plant-based burger that looks, cooks, and tastes like a fresh beef burger. Alongside the patty, owner Ross Forder spent over a year and a half expertly creating a secret seasoning to perfectly complement the Beyond Burger, going through multiple tastings in California and London. This unique seasoning is then blended through every Halo Burger. The concise menu features four burgers – The Halo Burger, Quarter Pounder with Cheese, Cheeseburger, Hamburger – and two sides. No faffery, just good, honest fast food coupled with a heavy hit of nostalgia. On a recent visit I decided to try the flagship The Halo Burger (£9.50) which comprised two 1/8 lb hand-formed patties layered with old school diced white onion, melted 100 per cent plant based American-style cheese, a slice of beef tomato, crisp lettuce and tangy signature house-made sauce. The burger was like a hand grenade to the palette; alarmingly meat-like, the patty had a great bite and a texture shockingly close to the real thing, I thought some witchcraft was going on. The patty had a wonderful charred, smoky flavour with the overall taste similar to something you’d find in Five Guys. I’m not one for hyperbole, but this was by far one of the best vegan burgers I have ever tasted. Reminiscent of In-N-Out’s off-menu animal fries, Halo Burger’s Don’t Have a Cow fries (£4.50) featured pink salt fries topped with melted cheese, their signature tangy sauce and caramelised onions. While it won’t score top marks in a beauty pageant, this side dish certainly made up in taste – the chip, sauce, onion combo was stick-to-your-ribs wonderful. 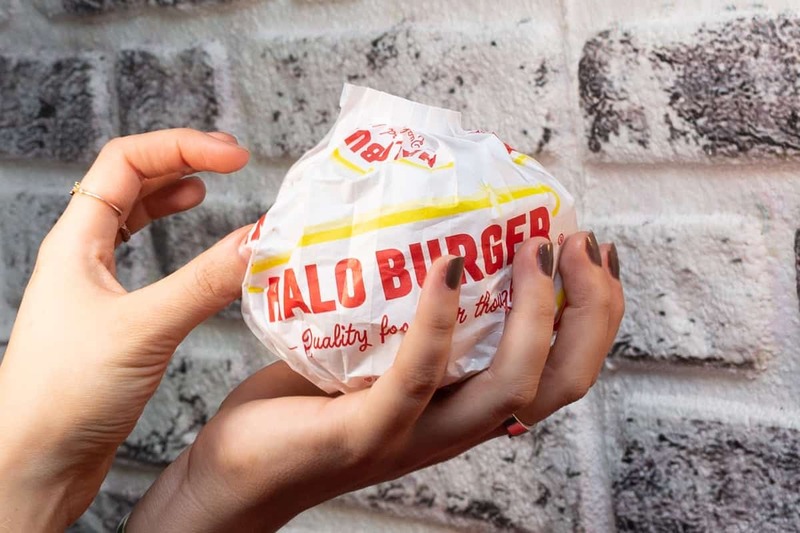 Halo Burger have also made a conscious effort with their food packaging; all burgers come served in 100% recycled paper that keeps the burger hot, full of flavour and drip-free while eating. This trip just changed my meat-eating mind: there are flesh-free alternatives out there that taste exactly like the real thing, and I urge you all to try it. By the taste of it, this once dubbed ‘fleeting food trend’ is definitely here to stay. 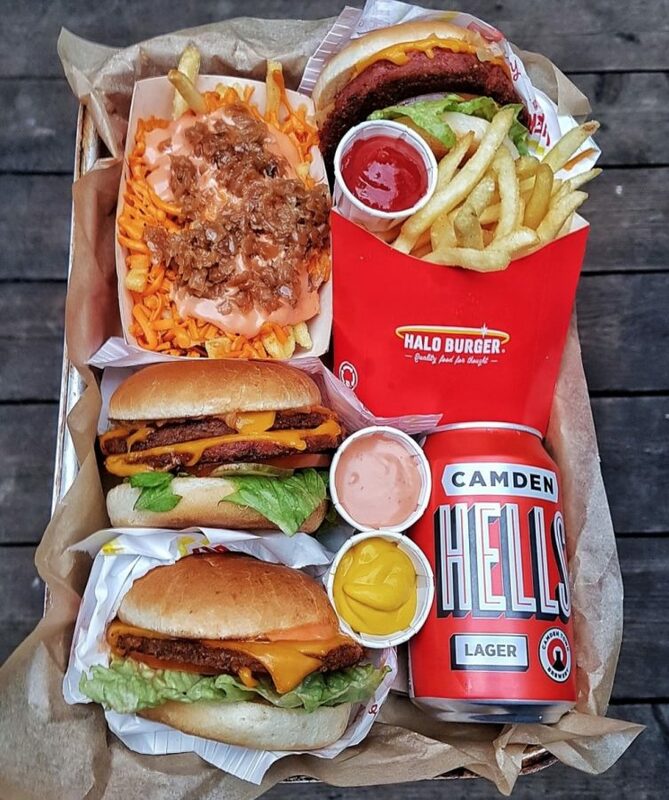 Halo Burger can be found at Pop Brixton, 49 Brixton Station Road, London, SW9 8PQ. Alicia is a food and travel journalist with a serious appetite for discovering new restaurants and the latest culinary trends. She has contributed to a number of online publications including About Time Magazine and Good Housekeeping. Alicia is all about eating and writing. And writing about eating.